Mass, an arrangement of 100 fibreglass and resin skulls, is a highlight of the National Gallery of Victoria’s inaugural triennial. When it comes to creating resinous sculptural depictions of the human body, showcasing obsessive attention to every pore and follicle, the Australian artist Ron Mueck delivers the wow factor with disturbingly realistic pieces such as Dead Dad (1996) and Pregnant Woman (2002). But is Mueck Australia’s most internationally successful contemporary artist? The National Gallery of Victoria says “yes”, and has backed its London-based horse by commissioning his largest installation work to date. Not only that, the NGV committed a team of expert staff to help Mueck make the commissioned work. Then the gallery acquired the ambitious piece for its own permanent collection, using funds from the fabled Felton Bequest, a monetary gift which has paid for a vast quantity of art purchases by the gallery since benefactor Alfred Felton’s death in 1904. The work by Mueck is Biblically or quantitatively titled Mass, and was finished just weeks ago. It features exactly 100 fibreglass and resin skulls, each one measuring about a metre high. 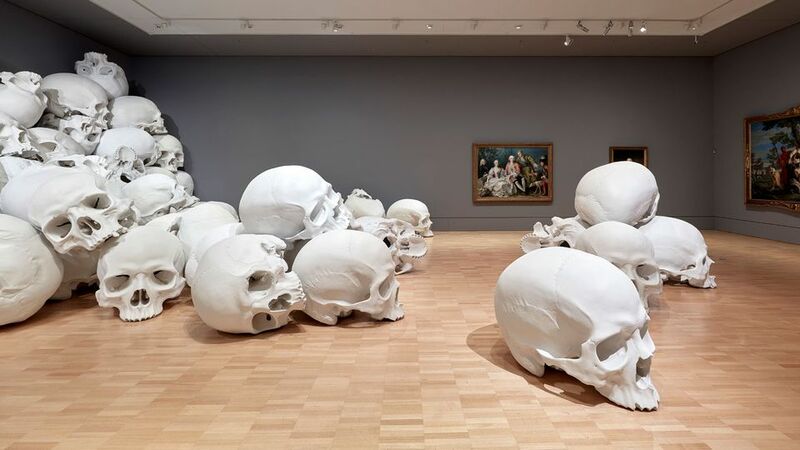 The arrangement of the skulls, Mueck tells The Art Newspaper, can be reconfigured whenever the work is installed in a new venue. At the NGV, Mass goes on view tomorrow (15 December) as a highlight of the inaugural NGV Triennial (15 December–15 April) which showcases the work of 100 contemporary artists and designers from 32 countries. Mass occupies a room of the NGV’s sumptuous 17th and 18th Century European paintings galleries. Mueck was back in Melbourne for the two painstaking weeks that it took to arrange the skulls with the help of electric cranes. The final placement of the skulls gives the impression that they were once stacked neatly against the rear wall of the gallery but that, owing to the passage of time or to some seismic event, they slipped and rolled one by one until they resembled an unkempt scree of cascading craniums. The artist made a small model of the NGV space and arranged tiny skull models in it, to show the Australian end what his thoughts were, according to senior curator of Australian art at the NGV, David Hurlston. In 2010 the NGV mounted a show of Mueck’s work, which had come to prominence in 1997 thanks to its inclusion in Charles Saatchi’s ground-breaking exhibition, Sensation. Mueck’s sculptures are always smaller or larger than life-size. In fact, Hurlston is aware of only one lifesize work by Mueck—a dog that was once in the Lord McAlpine collection. Today its whereabouts are a mystery. ← Salvador Dali catalogue raisonné : completed !